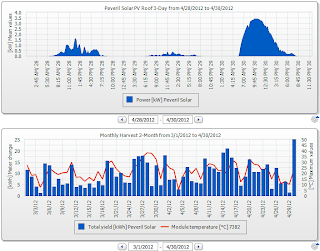 30 April 2012: After a week of rain, and after a heavily rainy Sunday in which we scored the lowest April PV you could imagine, 1.4 kWh, we had a sunny Monday. Didn't seem exceptional, but when you have cold air temps and bright sun, you do well. 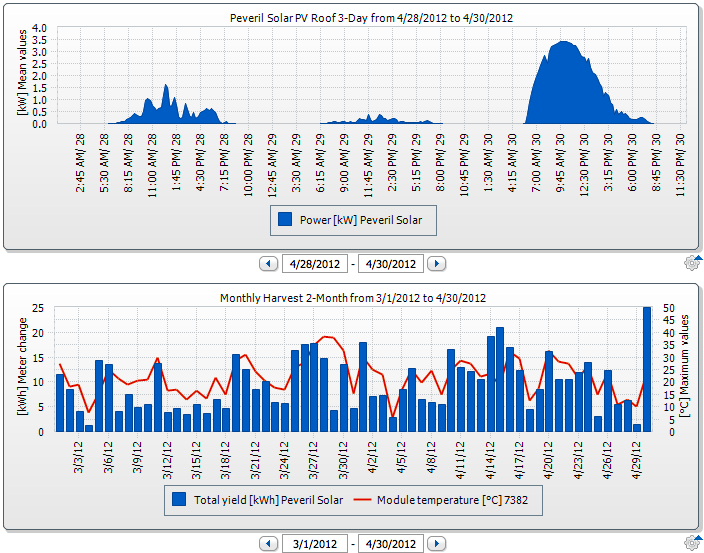 We got 24.80 kWh in a day.... the last time we got as much as that in a day was last year's Summer Solstice - June 20-21. Seems amazing. Amazing for April. This was also the first good sunny day since we had metering working on the thermal system, we had 14.0 kWh for Sunbox and 5.0 kWh for the Tubes. As the Sunbox has different plumbing circuitry from what it had last year, I shall have to get used, perhaps, to lower daily scores in summer. We shall see. I no longer send the whole ground loop through the Sunbox - this was effective, but a major risk of unreliability if any part of the circuit went wrong.